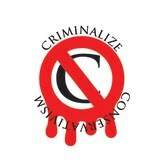 Criminalize Conservatism: Eliminate Conservative Gerrymandering - HOW! Eliminate Conservative Gerrymandering - HOW! Republicans have a new strategy for 2016: Change the rules of presidential elections in order to swing the electoral college in the GOP's favor. 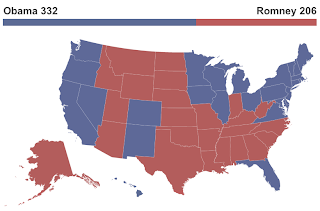 In the 2012 election, President Barack Obama defeated Mitt Romney by 126 electoral votes. 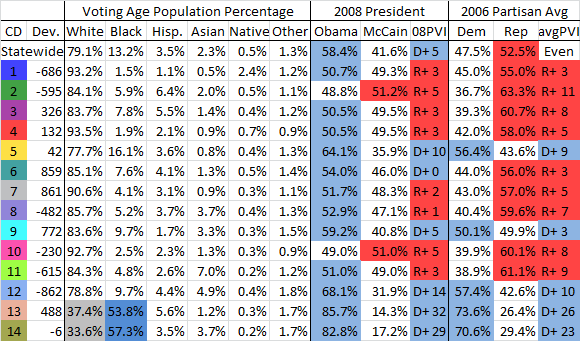 Within the 26 states that Obama took, Romney won a plurality of votes in 99 congressional districts. Obama, on the other hand, won only 32 congressional districts in red states. Each state has two more electoral votes than congressional districts. The most common Republican proposal -- under consideration in Pennsylvania, Wisconsin and Michigan -- follows the same rules already in effect in Maine and Nebraska, which allocate the two additional votes to the winner of the statewide popular vote. This is what the 2012 electoral map would have looked liked had each state apportioned its electors using these rules. The legislation introduced in Virginia, however, goes even further and proposes to allocate the two remaining votes not to the candidate who wins the state-wide popular vote, but to the candidate who wins the majority of congressional districts. 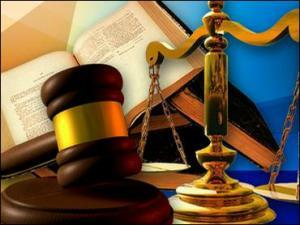 This would give Republicans an even bigger advantage in that state." "All in all, these three states could send anywhere from 7 to 13 more Democrats to Congress and give us a vastly improved chance at breaking Republicans' hold over the state legislatures in all three states. 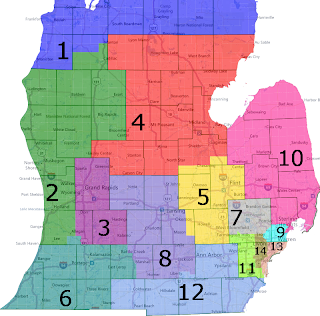 This is the Michigan congressional map (apologies to any Upper Peninsula folks) passed by the Republican controlled state legislature and signed by governor Rick Snyder (R), who recently signed Right to Work for less legislation into law. As should be immediately apparent, southeastern Michigan is a contorted mess. 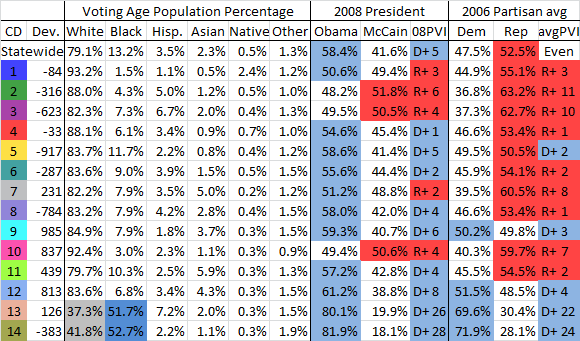 It also very efficiently packs Democrats into just 4 districts, leaving us 5 total while Republicans and Mitt Romney won 9 of the state's 14 districts in a state where Barack Obama won by nearly 10%. Had this map been in use for the 2012 elections, we might have won three more districts, the 7th, 8th, and 11th. Were it to be in place for this cycle's 2014 midterms, we would have a great shot at picking up the 11th where nutjob Kerry Bentivolio (R)'s district shifts nearly 7% to the left. 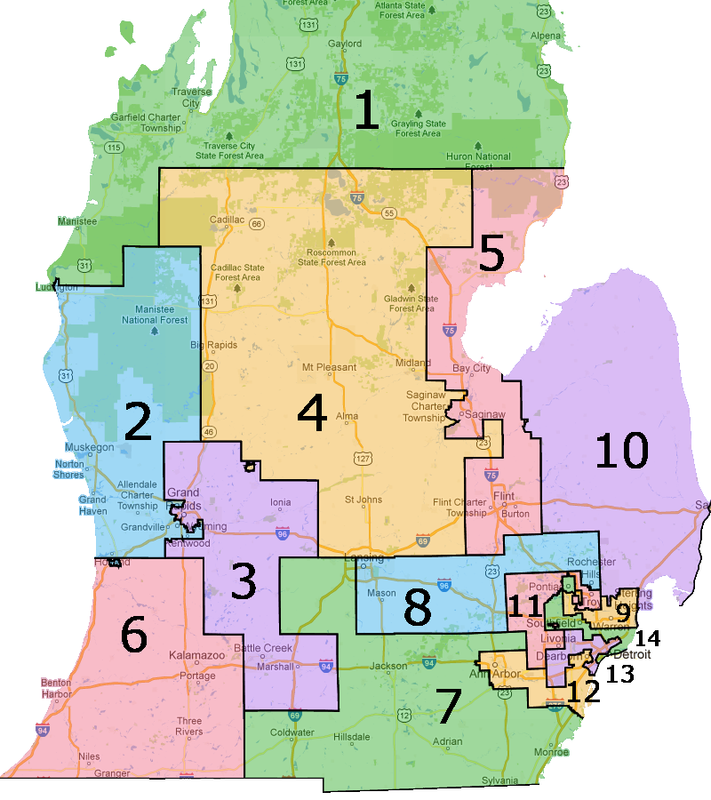 After that, Mike Rogers (R)'s 8th district becomes a prime pick up opportunity without a gerrymander to crack Lansing, representing a 6% shift leftward. State Senate Minority Leader Gretchen Whitmer (D) would make an excellent candidate if she decided not to run for Governor or Attorney General instead. That's two probable pick ups right out of the gate, but the benefits don't end there. The 4th district, represented by Republican Ways and Means Chairman Dave Camp (R) becomes 4.5% more Democratic with the unification of the tri-cities area. Camp is well entrenched, but with a strong campaign and the continuing unpopularity of congressional Republicans, this one could be competitive. Additionally Fred Upton (R)'s 6th district becomes nearly 2% more Democratic and after his surprisingly weak showing (for a long-time incumbent) last year, he could potentially be vulnerable. If a commission indeed drew Battle Creek into the district as I have, former 1 term Rep. and ex-state senate minority leader Mark Schauer (D) would make an excellent candidate. Furthermore, the 1st district, where tea partier Dan Benishek (R)barely eked out a victory over former state Rep. Gary McDowell (D), remains just as competitive. On the negative side, Paulista Justin Amash (R), who won by just single digits sees his 3rd district become 2% more Republican. Finally, 5th district freshman Dan Kildee (D)and Dean of the House John Dingell, Jr. (D) both see their districts weakened, but not enough to be vulnerable. This doesn't even begin to cover the state legislature, where the Republican gerrymander in the state House of Representatives saved the party's bacon and where their state Senate gerrymander makes it impossible for us to ever win that chamber. 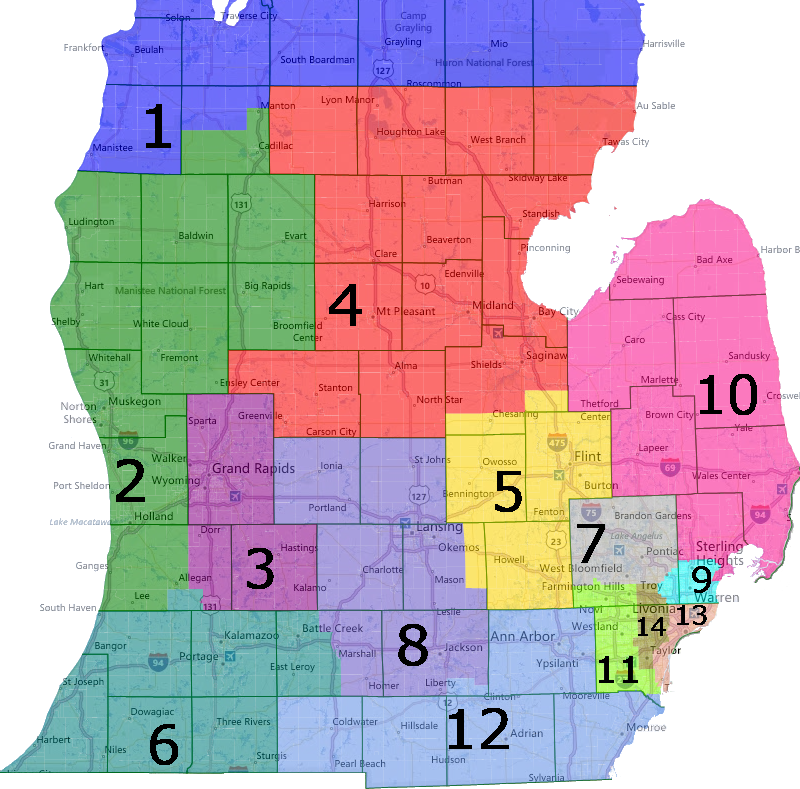 This last point is what makes non-partisan redistricting have no drawback in Michigan. We will never be able to gerrymander the state ourselves so there's literally no reason not to prevent Republicans from doing so. As my area of expertise is federal politics, rather than at the state level, I can't say with any clarity how many seats we might gain, but if the map ended up looking anything like this it would be several. 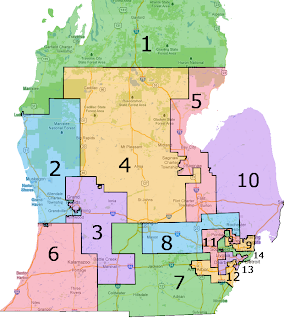 With Rick Snyder's sinking popularity and non-gerrymandered legislative maps, we might even be able to win the trifecta for the first time since the 1982 elections. "So how could this much improved map come to pass? Per Ballotpedia constitutional amendment initiatives require 10% of the number of votes cast in the previous gubernatorial election or 322,609 valid signatures (meaning we'd need to collect a decent amount higher as some will be thrown out). Petition gatherers must be registered voters in the state and we have a 180 day window to collect them all. This shouldn't be terribly difficult to achieve in a state that cast 2,564,569 ballots for Barack Obama, or nearly 8 times the required signatures. Primarily, clearing this hurdle will involve mobilizing volunteers or, if we could raise enough money, paid signature gatherers. Democrats successfully put measures on the ballot last year, such as an effort that attempted to enshrine collective bargaining rights in the state constitution (though it lost 57% to 43%) as well as a successful referendum that blocked the state's odious Emergency Manager law Republicans had passed to circumvent locally elected governments. The hardest part of the process here will be collecting enough valid signatures. Once on the ballot we just need a few million dollars to run a campaign familiarizing people with the amendment and I guarantee it will pass the 50%+1 threshold with flying colors. Conveniently, Democrats are already planning on putting another amendment on the ballot, one to preempt the state's recently passed Right to Work for less law. 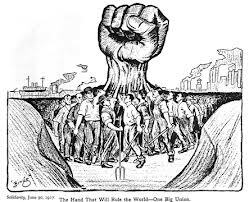 It would be a great feat of efficiency if the labor movement would get involved here too as there are hundreds of thousands of union members in the state alone who could easily help us clear the signature hurdle. So how can you help? One step would logically be for lawyers familiar with constitutional law and the initiative process in the state to formulate legal initiative language that will be constitutional (again I am not a lawyer). Then, as we did in the Wisconsin recalls in 2011-2012 and the Michigan and Ohio labor initiative campaigns from 2011 and 2012, we needorganization. That means any of you who are politically active in Michigan should call your contacts, whether they be fellow activists, elected officials, union representatives, etc. and start formulating a plan to organize a signature drive. Once the signature petition process has been organized, we will need fundraising. The bang for the buck here is likely much better than any congressional race as just a few million can help us elect multiple new Democrats. Ideally, with a readership as large as Daily Kos has, front pagers like Markos will get involved here too as Daily Kos has been responsible for a good chunk of the money raised and volunteer hours spent during the Wisconsin recalls in particular. Were I living in Michigan, I would certainly volunteer, but my means of activism are limited to donations and the soap box, which is why I need you, fellow Kossacks, to get involved!" For plans for Ohio, Florida, Arkansas, and Nebraska go to http://www.dailykos.com/story/2013/01/22/1179286/-Republicans-STOLE-the-House-Here-s-What-YOU-Can-DO-to-Fight-Back. So if you've made it this far thank you very much for reading and please, please get involved and help make this strategy a reality. While in an ideal world we would have fair districts nationwide with mixed-member proportional representation on top so that line drawing doesn't affect the partisan control of congress (and no senate or electoral college too), we don't live in an ideal world. I'll support independent redistricting in Illinois and Maryland when we get it in Texas, Pennsylvania, North Carolina, and Wisconsin, but when Republicans have institutionalized an unfair advantage in the House of Representatives, I adamantly believe that pursuing independent redistricting in these key states is the best way to counter what is essentially electoral theft. So please, spread the word and get involved!" Independent redistricting is the first step towards criminalizing Conservatism, to be followed by further 1.) organization, 2.) fundraising, and 3.) activism to ensure that the world does not crumble under the weight of the most far-reaching, ponderous, and vicious criminal conspiracy in our history - probably in the history of the world.